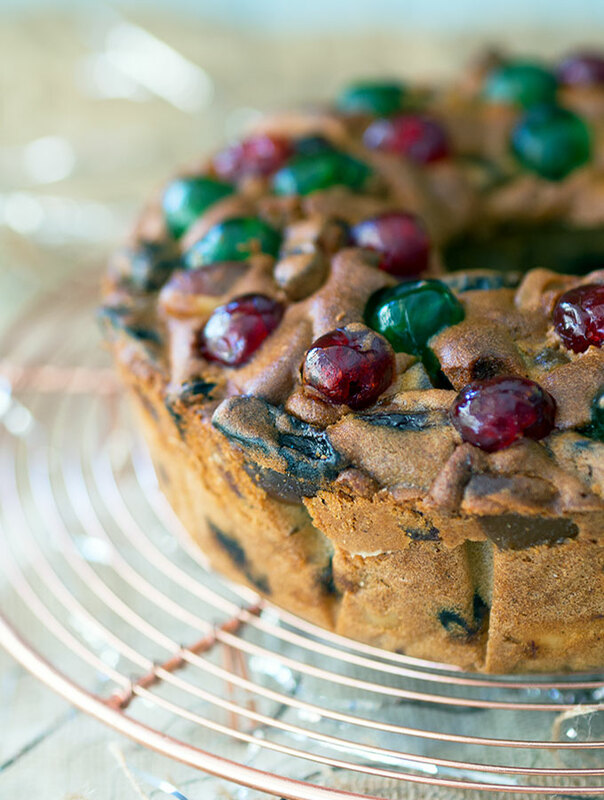 This is another of my mother’s Christmas cake recipes, Festive Christmas Fruit Cake, or better known as Stained Glass Window Cake. Mum probably aquired this recipe from the Women’s Weekly, but as it is in her writing and words, and the fact she has been making it since I can remember, let’s call it hers. We were never a one Christmas cake family. I shared with you last year her traditional Christmas cake recipe (again probably ripped from WW and made her own over the years). Two Christmas cakes were always made. Which is actually quite funny as they were large enough to feed an army, and we were a little family of three. But these cakes went on our yearly (almost month long) vacation down the South Coast of NSW. They were devoured in their entirety before it was time for us to return home a little sick for fruit and cake. 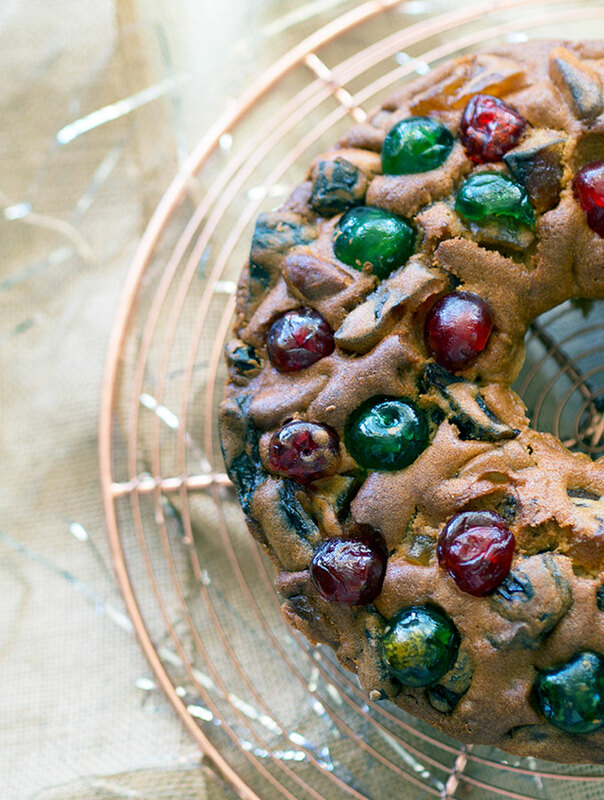 My favourite cake was always this festive Christmas fruit cake, or you may better know it as stained glass window cake. It was the whole glace cherries and large chunks for glace fruit that filled the cake, along with whole crunchy Brazil nuts, which makes it a fruit and nut mouthful. There really isn’t a lot of “cake” in this cake as it’s packed with fruit and Brazil nuts. The cake portion really acts as the “glue” to hold it all together. This is how it gets the stained glass window cake name. 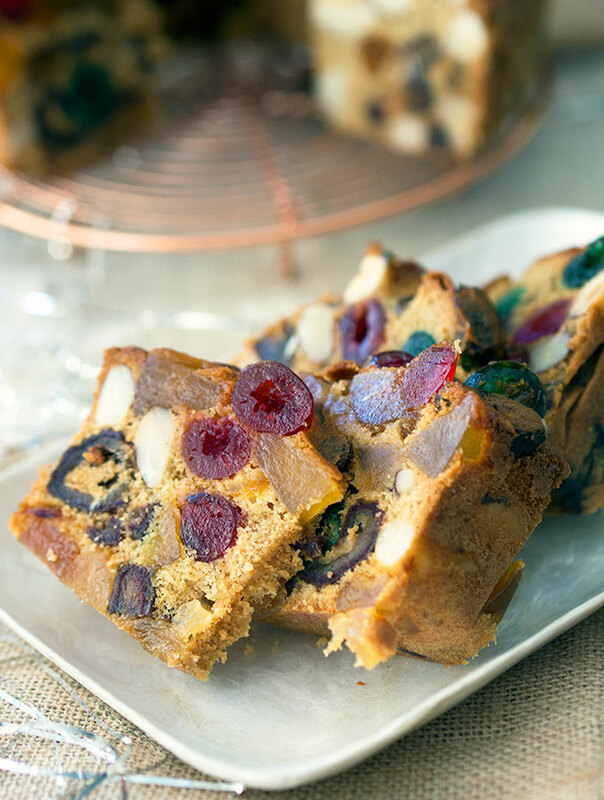 When you cut the cake the jewel coloured glace fruit are revealed, and when sliced thin enough light shines through them. A small slice of this cake goes a long way and I feel it is best served with a nice strong double espresso. A Turkish coffee would go really well with it too. I think you get the picture, strong coffee to combat the sweet glace fruit in this cake. 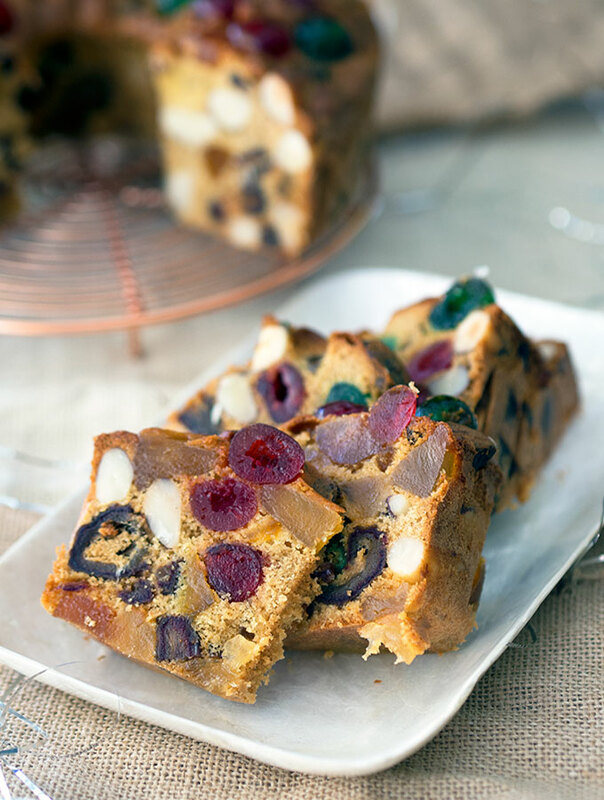 Festive Christmas Fruit Cake Recipe, better known as Stained Glass Window Cake, packed with glace fruit & Brazil nuts. Preheat oven 160°C (?°F). Line and grease a ? ?cm ring tin. Stone and half dates, chop pineapple and apricots, leave cherries and Brazil nuts whole. Beat eggs until they are thick, pale yellow and creamy. Add sugar, vanilla bean paste and run. Continue beating until all the sugar has dissolved. Stir in flours and salt. Then stir in the fruit and nuts, mix thoroughly. Pour mixture into prepared cake tin, bake in the oven for 1.5 hours, or until golden and cooked through. Remove from oven and brush with extra rum, cover and leave to cool in tin. Remove from tin and wrap in plastic wrap and foil, keep in fridge until required. Leave cake to come to room temperature for serving. (If not in Australia or similarly hot climate for Christmas, store in an airtight container, refrigeration not necessary). Christmas cakes are always best cooked at least a week before needed. This way it gives them time to settle and the flavours develop, especially if you are like me and add a good whack of booze to your Christmas cakes. I generally have my fruit soaking in my alcohol of choice for a month before I cook my cake. The beauty of this cake is it is ready to go once baked and cooled. Of course you can make it well in advance, but due to the make up of the cake, it isn’t full of booze laden fruit. A brush over the top with rum once it is out of the oven is what gives you the booze effect. Of course, if you aren’t a lush like myself, you can forgo the alcohol. I’m always saddened by how many people dislike Christmas cake. This one looks like a cracker though! I’m heating up the espresso machine, so you know what that means? Yup, get on over here with some of this cake!